During an investigation of drug dealing in Kona on the Big Island in October 2010, police found controlled substances and a powder identified as MDPV at a local residence. “This incident clearly indicates that this new chemical is already present in Hawaii,” according to Keith Kamita, administrator of the Department of Public Safety’s Narcotics Enforcement Division. On Oct. 15, 2010, Kamita called for an “emergency scheduling,” to place MDPV and another designer drug called 4MMC onto a Schedule I controlled substance category on a temporary basis. Of the five schedules (or classifications) listed in the Controlled Substances Act, Schedule I contains the most harmful and dangerous drugs, including marijuana, heroine, peyote and ecstasy. Mephedrone is increasingly being sold at local convenience stores, smoke shops, drug paraphernalia stores and online as a legal product. The toxic white powder, which is manufactured in China, is chemically similar to stimulant compounds found in the khaki plant of eastern Africa. MDPV comes in the form of capsules, tablets or white powder that can be swallowed, smoked, snorted or injected. 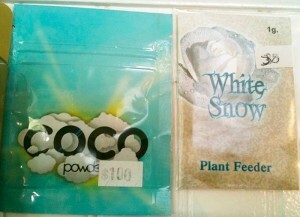 It is sold online for about $25 per 300 mg., with a gram running anywhere from $40 to $100. Synthetic stimulants like MDVP produce symptoms such as muscle twitching, vivid hallucinations, intense paranoia and mental confusion, sweating, insomnia, dizziness, heart palpitations, a sudden rise in blood pressure and prolonged panic attacks. On Feb. 1, Kerlikowske praised Hawaii, along with half a dozen other states, for “introducing legislation to ban the retail sales of Mephedrone. Rep. Aquino explained that HB 1217 was deferred because the title of the bill did not match it’s content. HB 1085 was then introduced, which would essentially mimic the original House bill by classifying Mephedrone as a Schedule I substance and placing it under the jurisdiction of the Department of Public Safety. As of Feb. 17,, the bill had passed through the Committee on Public Affairs and Military Safety and will next be heard in the House Judiciary Committee. « Green Thieves, Beware	» Free Space?